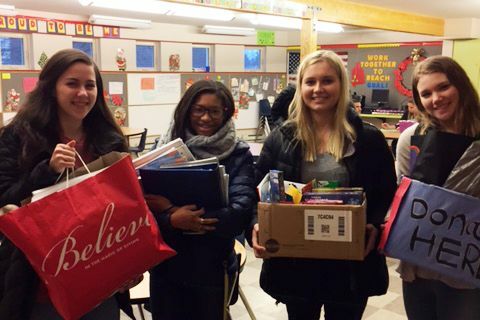 Students participating in Grier's community service program, Grier Giving Back, delivered donations of school supplies to the Gloria Gates Memorial Foundation. In this event organized by the Junior Class, Grier homerooms competed to collect the most items to donate, resulting in over 600 items. With 200 items, Dr. Nancy Burke's homeroom was the winner of the competition, earning a special breakfast of hot chocolate, pastries, and bagels delivered right to the classroom. The Gloria Gates Memorial Foundation is an Altoona-area charity with a goal of helping kids succeed in school and develop into successful adults. The foundation encourages "children to dream big, and to understand that they can reach their goals if they work hard, develop integrity, and stay away from negative influences." Learn more about Community Service at Grier. Delivering boxes of donated school supplies to the Gloria Gates Memorial Foundation in Altoona, Pennsylvania.